The nineteenth century was a time of unprecedented change, and nowhere was this more apparent than London. In only a few decades, the capital grew from a compact Regency town into a sprawling metropolis of 6.5 million inhabitants, the largest city the world had ever seen. Technology-railways, street-lighting, and sewers-transformed both the city and the experience of city-living, as London expanded in every direction. 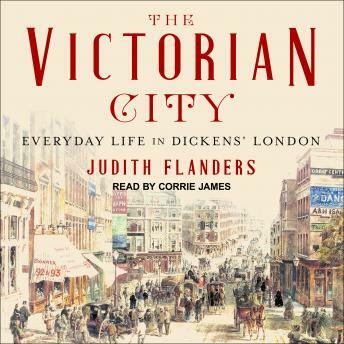 Now Judith Flanders, one of Britain's foremost social historians, explores the world portrayed so vividly in Dickens' novels, showing life on the streets of London in colorful, fascinating detail. From the moment Charles Dickens, the century's best-loved English novelist and London's greatest observer, arrived in the city in 1822, he obsessively walked its streets, recording its pleasures, curiosities, and cruelties. Now, with him, Flanders leads us through the markets, transport systems, sewers, rivers, slums, alleys, cemeteries, gin palaces, chop-houses, and entertainment emporia of Dickens' London, to reveal the Victorian capital in all its variety, vibrancy, and squalor.